One metre of decking plank, which is presently being replaced with a replenishable hard wood called Ekki from a well respected and managed renewable source, will cost over £20.00 a meter to purchase and fit. 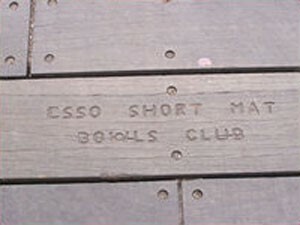 £40 – your name will be engraved alongside others into one of the new planks fitted to the pier. £70 – the names of yourself and your partner will be engraved alongside others into one of the new planks fitted to the pier. £100 – Sponsoring a 7 metre long plank enables you to have a message (up to 30 letters long, names included) (additional letters will be charged at £2 per letter) engraved alongside others onto a new plan. A brilliant gift idea & ideal for a birthday, wedding or anniversary present! NB: There could be a very substantial delay (in excess of one year) before messages can be engraved on planks. We can only engrave on remaining new planks already in place. Engravings can only be done during good weather and when planks are completely dry. For further details please call the Hythe Ferry office 023 8084 0722.